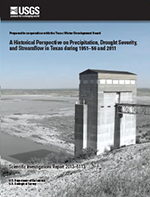 The USGS Texas Water Science Center continuously monitors the status of the State's principal rivers, reservoirs, and selected aquifers. Stations with long-term continuous record are used to compare existing streamflows, reservoir storage, and ground-water levels with normal and extreme recorded values to measure the potential for drought, or the severity of an existing drought. In general, when the water content in streams, reservoirs, aquifers, or soils falls below the long-term average, a pending or potential hydrologic drought may exist. The severity of a hydrologic drought is not always obvious until these water supplies are seriously depleted. The USGS network of long-term continuous record stations is important in measuring the severity of an existing or potential drought and making projections of subsequent drought conditions. 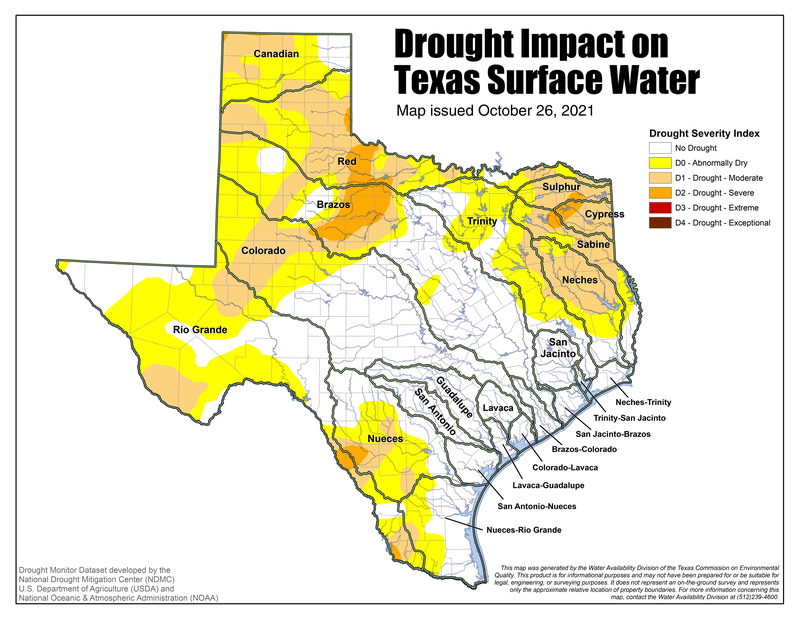 These are the primary resources for Texas drought conditions and impacts. Based on about 280 USGS sites in Texas having at least 30 years of record. The data used to produce this map are provisional. Click image to view larger, interactive version. The USGS operates over 400 rainfall monitoring sites in Texas. However, these sites are for operational purposes. Routine inspections and other quality assurance measures are not performed that would make the data suitable for archival, retrieval, or interpretive uses; therefore, rainfall data will NOT be available for longer than a 120-day display period. US Rain Days/Consecutive Dry Days are computed daily, based on data from the National Weather Service. 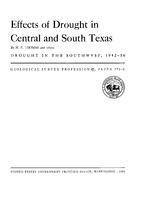 Drought text modified from Hanson, R. L., 1987, Base flow as an indication of drought occurrence. In: S, Subitzky (ed. ), Selected Papers in the Hydrologic Sciences: U.S. Geological Survey Water Supply Paper 2330. pp. 115-129. 1 Huschke, R.E., ed., 1959, Glossary of meteorology: Boston, American Meteorological Society, 638 p.
2 Rosenberg, N.J., ed., 1979, Drought in the Great Plains- Research on impacts and strategies: Proceedings of the Workshop on Research in Great Plains Drought Management Strategies, University of Nebraska, Lincoln, March 26-28: Littleton, Colorado, Water Resources Publications, 225 p.
3 Yevjevich, Vujica, Hall, W.A., and Salas, J.D., eds., 1977, Drought research needs, in Proceedings of the Conference on Drought Research Needs, December 12-15, 1977: Colorado State University, Fort Collins, Colorado, 276 p.